Good thread to read on these seats. It's a C5 but the C6 is very very similar in dimensions in this application. Is Braum just another generic Chinese crap seat? I wouldnt bother, but some Sparco, OMP, or Recaro seats if you need new seats. Having you back snapped due to crap Chinese seats isnt worth it. Recaro Speed V seats are a nice option and they are designed to fit the c6. They are over $3k a pair with brackets though. Yea, pretty much. A local guy has a pair of Braum’s in his C5, so they fit. You can buy a brand new set (pair) of OMP’s for less than the price of the Braum. A set of Sparco’s would cost about the same. I went with OMP’s for my car. Last edited by ttx350z; 12-28-2018 at 06:02 PM. I have them installed in my c6, so yes . thank you brotha! Any adjustments needed to be made? Nope. Fit just as you'd need them to. I have the Venom-R fixed back seats, not sure about others but they work just fine. You got some pics of them installed? I am looking into these as well, but I heard you have to tweak the mounting rails and all that to get them to work. Not sure about that. I bought some seat brackets that weren't designed for these seats because i got a really good deal on them. I did have to modify them but basically it was just cutting a tab off of the side of the rail because it was too narrow and poked the seat when it was mated to the rail. Don't have any photos currently, car is down for modifications. From what I’ve gathered I can run vetteworks seat brackets and do the planted mount style, only downside is no automatic seat adjustment. 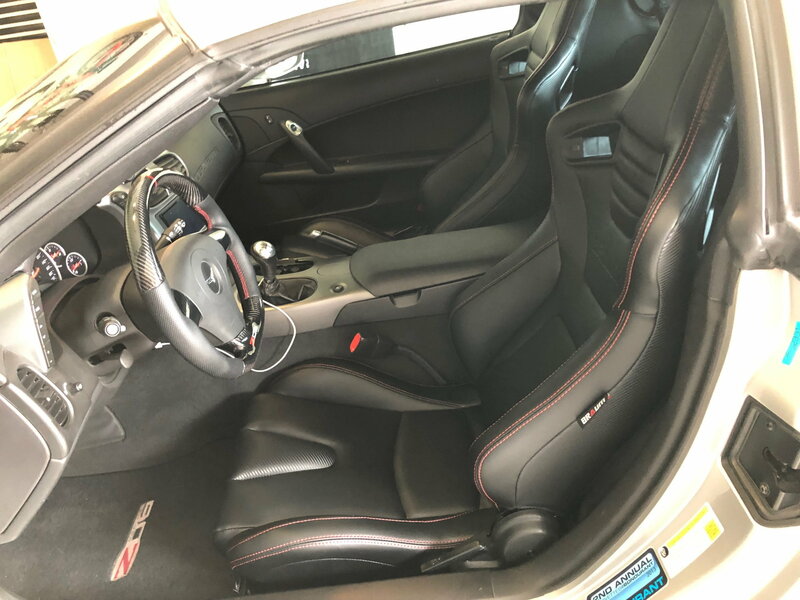 I recently contacted Braum directly about reclining seats that would fit in my C6Z and they recommended I go either fixed back or I'll need to swap out the driver seat with the passenger. Their concern was the reclining handle would not clear the side panels. Being the hardheaded person that I am, I decided to pull the trigger anyways on some Braum Elite-X seats with Planted brackets and just deal with the consequences later. Let me say this...it will take some modifying of the seat brackets as the holes in the Planted brackets won't line up in order to get them to fit correctly. I ended up having to either drill new holes or elongate existing holes on the brackets using a round hand file in order to shift the seat sliders to the right position. Also, with these Planted brackets, your OEM seat buckle will need to mount to the Planted brackets (just like the OEM seats did) so you'll have to get the correct threaded bolt + nut to secure it. Of course the length of the bolt will most likely be long as mine were so get ready to do some cutting to shorten the bolts. In addition, there's the other end of the seat belt that also needs to bolt into something so I ended up mounting it on one of the rear bolts on the floor board where you would mount the Planted brackets to the car. 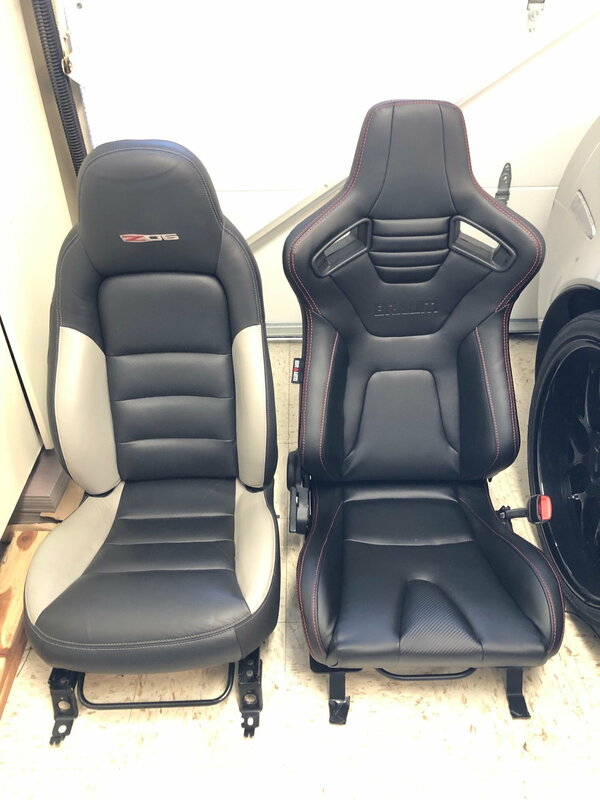 Yes, I know these seats are nothing more than the cheap chinese made Ciphers seats or Corbeau's but IMO these look better. If you want something with less of a hassle and more plug n play, I'd recommended just going with Corbeau's RRS reclining seats as their sliding brackets don't require any modification to my knowledge but it'll cost a little more. Keep in mind that the Braum's or Corbeau's will sit lower by about an inch than your stock seats so if you're short, this may not be a good option for you. As you can also see in the pic there's not much room to raise the height on the seats as these are definitely taller. Overall, I'm pretty pretty happy with the seats as they hug you much better on the turns. My sliders work and I can recline as needed which is all I wanted. And even so it's not like you need to adjust them every day anyways, right? Hope this helps. Last edited by SpeedwaySD; 04-16-2019 at 11:53 PM. I recently contacted Braum directly about reclining seats that would fit in my C6Z and they recommended I go either fixed back or I'll need to swap out the driver seat with the passenger. Their concern was the reclining handle would not clear the side panels. Being the hardheaded person that I am, I decided to pull the trigger anyways on some Braum Elite-X seats with Planted brackets and just deal with the consequences later. Let me say this...it will take some modifying of the seat brackets as the holes in the Planted brackets won't line up in order to get them to fit correctly. I ended up having to either drill new holes or elongate existing holes on the brackets using a round hand file in order to shift the seat sliders to the right position. Also, with these Planted brackets, your OEM seat buckle will need to mount to the Planted brackets (just like the OEM seats did) so you'll have to get the correct bolt + nut to secure it. Of course the length of the bolt will most likely be long as mine were so getting to do some cutting of the bolts. In addition, there's the other end of the seat belt that also needs to bolt into something where I ended up mounting it on one of the rear bolts on the floor board where you would mount the Planted brackets to the car. 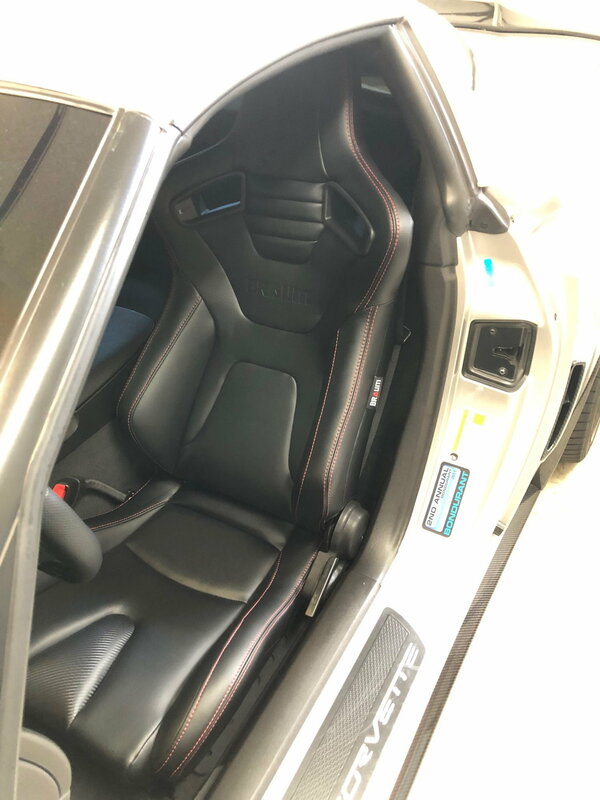 Yes, I know these seats are nothing more than the cheapy chinese made Ciphers seats or Corbeau's but IMO these look better. If you want something with less of a hassle and more plug n play, I'd recommended just going with Corbeau's RRS reclining seats but it'll cost a little more. With any of these 3 brands keep in mind that they do sit lower by about an inch than your stock seats so if you're short, this may not be a good option for you. As you can also see in the pic there's not much room to raise the heights on the seats either as these are much taller. Overall, I'm pretty pretty happy with the seats as they hug you much better on the turns. My sliders work and I can recline as needed which is all I wanted. And even so it's not like you need to adjust them every day either, right? Hope this helps. Which planted brackets did you use? I am considering the fixed Venom R seats from them and just wondering how much work I am looking at before diving in. I have been looking at vetteworks seat brackets since another corvette guy said he used their stuff and it worked great. Here's the part numbers for the Planted brackets. I got them from Carid.com. The vetteworks brackets look great too from what I can tell in the pics. Good luck man! I am thinking about doing this swap as well. Did you have to use any type of harness or plug for the airbag light like these? Last edited by Prostreet513; 03-04-2019 at 11:50 AM. Yes, those were the exact same airbag simulators I used from Vetteworks. If you have the power telescoping steering wheel there’s another part number for that. Just call Vetteworks if you’re not sure as they are always very helpful.